Givin Sugar. 8 x 10 matted Giclee' Print from Artist Michael Lee. 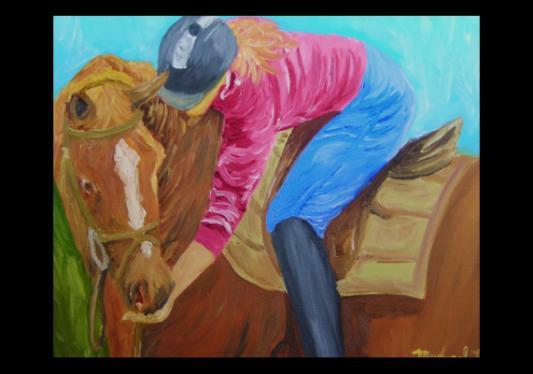 Michaels equestrian art is of impressionistic style and is described as "Poetry of Motion Captured in Oil" This Giclee' print will make a perfect gift for the equestrian or for yourself. Each of these prints are standard size matted in a black mat which makes the colorful art standout. TheHorseStudio.com review: A beautiful moment captured by the artist. Simple flowing strokes with soft colors reflect the love between horse and rider. Each print includes the artist bio attached to the back of the print. Michael is known for his bold brush strokes and artful use of colors. He has been working as an illustrator for many years for the U.S. Fish and WIldlife Service, amongst other skill sets. His work has been shown in many galleries throughout the South East of the U.S.A. and we are proud to welcome him to our art collection.